Safe Space is a campus-wide initiative to respect and support all people regardless of gender, sexual orientation, or sexual attraction. This program provides open support to individuals who identify themselves (publicly or privately) as lesbian, gay, bisexual, transgender, inquiring and questioning, with the aim of ensuring all LGBTIQ+ students and employees on campus perform at their highest level. The overall goal is for Life University to create and maintain a campus-wide atmosphere of inclusion and acceptance. 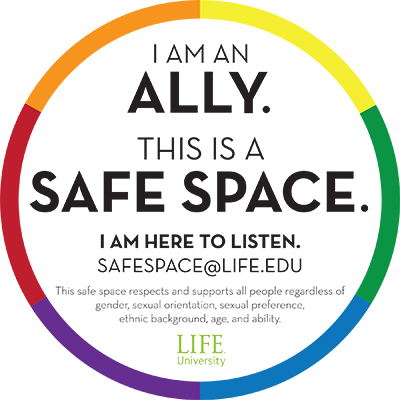 LIFE faculty and staff undergo training to become allies as part of the Safe Space program, and the Life University Safe Space symbol will mark their offices and workspaces as safe zones for nonjudgmental conversation and guidance to resources and support. We are grateful to the departments who have come together to support the creation of the Safe Space program, including Student Services, Academic Affairs, Service Initiatives, the Sid E. and Nell K. Williams Library and Marketing. For more information, email SafeSpace@LIFE.edu. AWARENESS: Gain insights into the lives and experiences of LGBTIQ+ and other marginalized people and self. KNOWLEDGE: Gain knowledge on facts relating to LGBTIQ+/marginalized people. ACTION: Bring awareness of self and others’ experiences together with knowledge to create positive change. SAFE SPACE AWARENESS training is meant to assist people who have asked for increased awareness regarding LGBTIQ+ inclusion. This program is one hour in length and is offered periodically throughout the year. If you would like to request awareness training for your specific department or organization on campus, please contact our group for opportunities available. SAFE SPACE ALLY training prepares an all-volunteer corps of staff and faculty who have received specific training to have greater awareness of LGBTIQ+ issues and demonstrated a desire to stand with LGBTIQ+ students, staff and faculty in support of their equitable inclusion in campus life. This program is three hours in length and is offered twice in the spring quarter and twice in the fall quarter. Once you complete the training to become an ally, you are welcome to join the SAFE SPACE COMMITTEE to assist in initiatives to make our campus a more inclusive environment for students, faculty, and staff.